The room that houses the Microsoft Windows 95/98 Maze Screensaver projection is separated from the noisy St. Laurent Street and the bustle of everyday life, and so becomes a quiet space for the viewer to watch the screensaver in a different way. One of the only ways of experiencing the screensaver now is through YouTube and the most common or familiar way of viewing videos on this platform is on a personal computer (desktop, phone etc). In this setting the videos are small and close to the viewer, they are usually surrounded by extra data like ads and other videos, and they are also viewed in conjunction with other activities like working, surfing etc. In this way, the projection room changes the conventional viewing practice substantially; it detaches the screensaver and the experience of watching a YouTube video in a way akin to a kind of isolation chamber and allows for more attentive viewing. This subversion attempts to highlight issues of engagement, attention span, and investment in relation to these videos and these different settings. 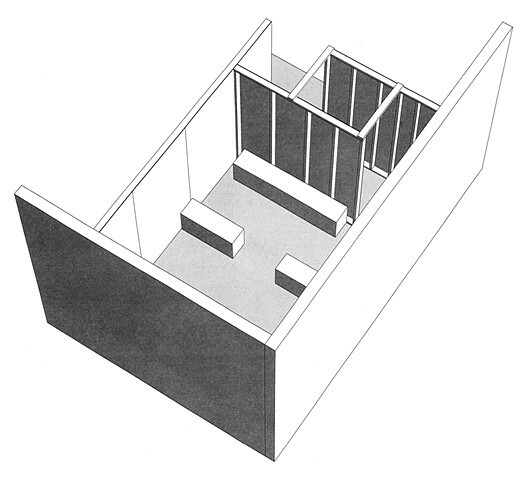 Additionally, the architecture of the projection room is in direct relation to the architecture of the virtual space in the projection, the entrance resembles the walls of a maze and its interior consists of miniature walls (benches). This mirroring is intended to create similarities between the spaces, as the walls become analogue and digital versions of each other. Ultimately, through the subversion of conventional viewing practices and the mirroring of real and depicted space, the projection room is intended to elicit a space for contemplation. The room becomes a place where the mind can wander and “get lost,” but also question these spaces and viewing practices, their differences, and their relation to expectations and experiences.